The Arts in Medicine (AIM) program provides arts-related workshops, activities and performances for patients, their caregivers, and staff. AIM recognizes the integral role of the arts in healing the spirit and transforming the treatment experience. A creative outlet helps to reduce stress, anxiety, boredom and the perception of pain. Programming includes fine arts workshops, group art activities, music therapy sessions, chair-side crafts in infusion, music performances in the waiting areas and more. One-on-one sessions may also be scheduled. No artistic experience necessary! Since its implementation in May 2010, AIM has grown tremendously and is now offered to patients across Tulane Medical Center. Offerings change regularly. Please check calendars for the updated schedule of the following programs. Private sessions can be scheduled with an artist-in-residence by appointment. Please call the Arts in Medicine office at (504) 780-6830. 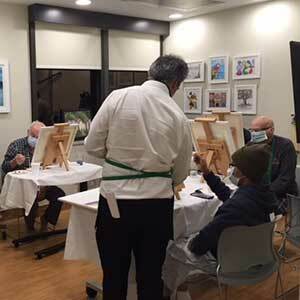 Infused with Creativity: Cancer Center Artists-in-Residence roam the Infusion Suite offering coloring, crafts, conversation and card playing. Music in Medicine: Cancer Center Musicians stationed in various areas of the Cancer Center provide music and music-related games for patients. Music Mends: Cancer Center & Pediatric Outpatient Clinic Medical student musicians provide music and music-related games to patients. Creative Clinic: Pediatric Outpatient Clinic Artists-in-Residence offer arts and crafts to patients in Hem/Onc and color with children awaiting appointments in the lobby. Music Therapy Sessions: Pediatric Inpatient Certified Music Therapist visits children in inpatient rooms, PICU and the Bone Marrow Transplant Unit to conduct sessions focused on music play/exercise, sensory stimulation, songwriting and more. 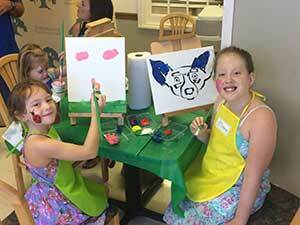 Art Cart: Pediatric Inpatiendt Artists-in-Residence visit children in inpatient rooms, PICU and the Bone Marrow Transplant Unit with arts and crafts projects. Art Packs: Hospital-wide, upon referral (teen & adult long term patients only) Leave-behind gifts containing a variety of art supplies and creative activities. Art On Call: Hospital-wide, upon referral An artist-in-residence will visit with a patient in any unit within the hospital upon referral for crafts and conversation. Med-top Mosaics: Hospital-wide (staff) Beautification initiative that recycles the colorful tops of medicine vials into unique works of art to be displayed throughout the hospital. Recreation Therapy: Stroke Rehab at Tulane Lakeside Artists-in-Residence work with the nurses and therapists of the unit to provide arts and craft projects to the patients that help to continue their rehabilitation exercises in a fun and creative manner. Tulane Pediatrics’ annual parade, Krewe De Peds hit the hallways of Tulane Lakeside Hospital for Women and Children on Tuesday, February 6. The artist-in-residence team is made up of Volunteers, Service Learners, Interns, and Practicum students from Tulane Medical School, Tulane University, Loyola University, and the community-at-large. Professionals and therapists for certain programming are brought in on a contract basis.